::(Welcome to Island Pearl Holidays, Maldives - Olhuveli Beach and Spa Resort; Nestled amidst tropical vegetation and shaded by graceful palms, is Olhuveli Beach & Spa. Surrounded by a vast sandy beach and a crystal clear lagoon, this is a truly beautiful island, where paradise seekers escaping from the pressures of everyday life can forget the outside world and let go of all inhibitions. A laid back and leisurely ambiance prevails on the resort, and you will find all the ingredients for an entertaining yet relaxing holiday at Olhuveli Beach & Spa. The island is reached by a 50 minute speedboat ride amidst breathtaking scenery. 63 Deluxe Rooms; are Beach fronted and have a terrace or balcony overlooking the beach and the lagoon. All rooms are comfortably furnished and equipped with ceiling fan, air-conditioning, mini bar, IDD telephone, satellite television, four poster beds, in-room safe, sitting area and a writing desk. The en-suite bathrooms are spacious and include hot/cold water, hairdryer and toiletries. 08 Beach Villas; are individually appointed facing prime beach front. All rooms are equipped with ceiling fan, air-conditioning, room safe, mini bar, IDD telephone, satellite television, a king size bed, sitting area, writing desk, a separate dressing area with full length mirror. 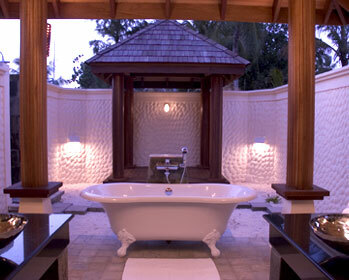 The en-suite bathroom is large with an open-air enclosed courtyard for maximum privacy. Bathroom amenities include an open air bathtub, hot/cold water, hairdryer and toiletries. Double glass paneled doors lead out to a large timber deck, which overlooks the beautiful beach and lagoon. 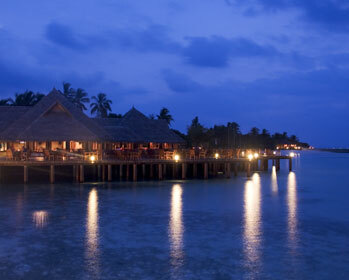 The rooms are luxuriously furnished with custom made teak furniture and lightings. 21 Deluxe Water Villas; Amidst the beautiful furnishing, guests will find an array of luxury amenities including air-conditioning, ceiling fan, room safe, mini bar, tea/coffee making facilities, spacious sitting area with custom made teak furniture, four-poster king size bed, IDD telephone, writing desk, satellite television, CD player. A luxury en-suite bathroom offers all amenities including toiletries, bathtub, bidet, hair dryer and hot/cold water. The Villas come with an extended deck overlooking the lagoon with chaise lounges for private sunbathing, and a swim-up platform, which provides direct access to the lagoon via private stairs. 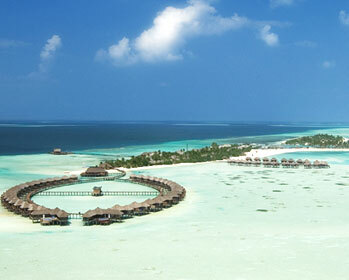 32 Jacuzzi Water Villas; Provide the same facilities as in the Deluxe Water Villas. A Jacuzzi takes pride of place in the large private sundeck, which extends out over the lagoon. 05 Honeymoon Water Villas; Discover island life at its fullest in these luxurious Villas each of which offers the same amenities as that in the Jacuzzi Water Villa. In addition these villas come with a separate living room with glass paneling on three sides offering a magnificent view. The deck also boasts a private steam cubicle. 02 Presidential Water Suites; offer the height of luxury for those seeking paradise. Situated at the far end, where the two footbridges meet, the suite will offer complete privacy and an un-paralleled view. The spectacular glass walled living room provides stunning views of the surroundings. The Suite will be fitted with the finest furnishing and amenities, combining modern design classics and traditional Maldivian architecture. The suite will comprise 2 king-size bedrooms with four-poster beds, a luxury en-suite bathroom with designer amenities and a kitchenette. Outside on the double leveled timber deck is a private plunge pool, open air Jacuzzi and chaise lounges. A staircase from the second level, leads into the lagoon below. Main Restaurant serving buffets for breakfast, lunch and dinner. In addition weekly theme nights including Maldivian is regularly organized, A la Carte specialty Restaurant (Lagoon Restaurant), Japanese Restaurant, Lagoon Bar (Main Bar) Pool bar, Beach Barbecue / Romantic Candle lit dinner, Special Lobster Dinner.